Like music, architecture is a political act. A controversial issue. Well, different architects have fought for such an understanding of their art through up to now fifteen issues of Pamphlet Architecture (available at Princeton Architectural Press). 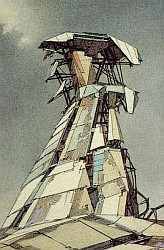 The one who probably is the most enduring and convincing in doing so is Lebbeus Woods, a Lansing, MI born architect who turned to theory in the late 1970s and is engaged with the RIEA, the Research Institute For Experimental Architecture. His attitude towards architecture is in my opinion very Third Wave-ish and shows an astonishing similarity to abstract repetitive electronic music (not in terms of appearance but expression). One of the links between these two artforms is that both have emerged out of decay. 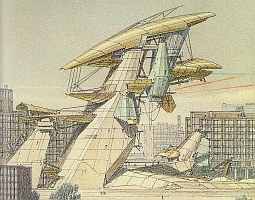 In his theoretical projects Lebbeus Woods focusses on building in (urban) enviroments that have been haunted by war or ecologic disasters, hence enabling him to shape an area from its very beginning. Accordingly, his last projects were situated on the Balkans. He seems to be attracted by the challenge of restoring, yet in an extremely experimental way, peace and community live through means of architectural innovation. As I said, the lion's share of his work is theory, though. Woods has often stated the need of architecture to be adapted to the advance of information technology, the developement of a global atomisation process and, above all, to the longings for abolishing social injustice and increasing de-massification of societies, hence efforts towards a humanization of construction as well as using it in order to establish respectation of the rights and needs of EVERY individual - in other words, as a cultural, social and polictical force. Although his drawings may look like sci-fi comic images, he has great technical knowledge. "Social justice is not an issue of masses, but of individuals. If the mass is satisfied with its salutes, but an individual suffers, can there be justice-in human terms? To answer 'yes' is to justify oppression, for there are always people willing to lose themselves in a mass at the expense of some person who is not willing to do so. To construct a just society, it is precisely this lone person who must first receive justice. Call this person the inhabitant. Call this person yourself." "No one wants to discuss the relationship between architecture and politics. It is an unsavoury subject. All those politicians, all that rhetoric, mixed with the timeless verities embodied in the noble forms of architecture. Yet the resistance to enter this discussion is not noble at all. All architects are deeply involved in their work with the political, whether or not they admit it to others, or to themselves. Most architects in this highly commercial era, who accept commissions and clients that affect public life, are in fact committed to supporting political systems. Only a handful work against it, because they believe it is regressive in terms of architecture or society, or both.It is no wonder that the majority of architects avoid the political implications of their work. They believe themselves to be creators, or innovators, when in actuality they are nothing more nor less than the executors of a physical and social order designed by those institutions presently holding political authority and power. The practice of architecture today is protected from confrontation with changing political conditions in the world within a hermetically sealed capsule of professionalism, which ostensibley exists to protect its high standards from the corrupting influence of political expediency and merely topical concerns. Architects themselves are complicit with this lie to the extent that they know it is enforced by the very institutions and individuals who commission the buildings they design, and who have a profound economic and social interest in maintaining a status quo in which they hold highest authority. Professionalism separates architects from people and their need to change the conditions of their existence, which is the essence of all politics. Far from protecting high standards of architecture, this separation impoverishes architectural work, reducing its productions to tokens of power, at best, and-at worst-to instruments of destruction. The best architects today have few commissions, or none at all. Of course, they want to build, but are dismissed by the institutions and individuals most threatened by the actual content of their work: an explicit manifestation of the will to change the conditions of existence and the architectural means to do it." Astonishing parallels to our beloved electronic music.